The Open Wall is a computer-based art installation developed by students, researchers and artists. The Open Wall enables its developers and observers to engage in dialogue that leads to increased understanding about creativity, cooperation, openness and authorship of software-intensive processes and content. The SArt project is conducted by the software engineering group in the Department of Computer Science at the Norwegian University of Science and Technology. We study the intersection of software and art in order to improve our knowledge of creativity, cooperation, openness and authorship in software-intensive processes and content. The Open Wall project is one of SArt's projects. In 2005 a group of architecture students built an experimental house with an LED façade; the house was intended to last for a year. The students asked the Department of Computer and Information Science (CIS) for help and cooperation. Hardware design was the most important task when the installation was built for the first time. When the experimental house was removed, the physical components were taken over by CIS. In 2007 a Masters student developed the Open Wall software into an open-source project with a BSD license. In January 2008 three groups of Masters students rebuilt the installation, reusing the existing hardware and software and developing the missing pieces of software and the content to be displayed on the Wall. In autumn 2008, the ITovation competition was organized and attracted twenty international contributors. 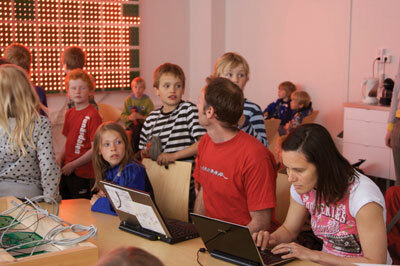 School children interact with the Open Wall. The Open Wall is a wall-mounted LED piece consisting of 96 circuit boards (16 x 6 boards) containing 2400 orange LEDs with a 5cm spacing. The wall is 480cm long and 180cm high. Each board has 25 LEDs on its surface, which emit light with 99 possible intensities. Each board has its own microprocessor, and power and Ethernet connection. Connection to the main controller device is established through a set of switches or hubs. While the installation was first erected on the façade of the experimental house in Trondheim, the current Open Wall is in a meeting room in the Department of CIS. It can be accessed by a Web-based interface: this enables users to upload and see the content of the wall with an Internet browser. The content produced by students, and by artists and engineers for the competition, is also on the Web. Technologists and researchers see the cooperation with artists as a source of inspiration and an opportunity to reflect on technology and find inspiration for innovations. Artists want to engage in projects like this to explore the possibilities inherent in technology and in interaction with technical people and researchers. Students choose this project as part of their curriculum because they enjoy cooperating with other students from different backgrounds. Technology gets old quickly. Technologists experience this inevitability as a source of frustration but also of motivation to continue learning about new technology. There are a number of questions worth asking. How important is the type and novelty of technology in a cooperation project between artists and technologists? Is the Open Wall a piece of art or a tool for artistic expression? Taking the installation from the public space into a meeting room in a University department has consequences in this respect. If the installation could be regarded as a piece of art when in was the public space, has it become a technological prototype or tool now that it has been moved into a private space in a university? What roles do the Web interface and source code play with respect to the artwork? In traditional art the identity of the artist is important; in this project in this project, different questions become important. Who is responsible? How can we attract and facilitate multidisciplinary participation in the development of such projects? How can we facilitate good software evolution by publishing it as open source? And is the BSD license most appropriate licence for this project? The novelty of our work lies in the nature of the process (an open cooperation between IT researchers, architects, artists and students), its objectives (artistic rather than business goals) and its open architecture, which enables everybody not only to upload content and become the artist but also to change the software governing the installation. Moreover, the process of bringing technology from the inside of a small computer or mobile phone to a big wall makes people reflect on and question IT in new ways. Software becomes visible and tangible. The novelty of the single component is not important. Students and artists who choose to work with the Open Wall in both curriculum-driven and hobby-driven projects do not pose questions about technology age. They are motivated by the unusual way in which the Open Wall puts components of technology together.